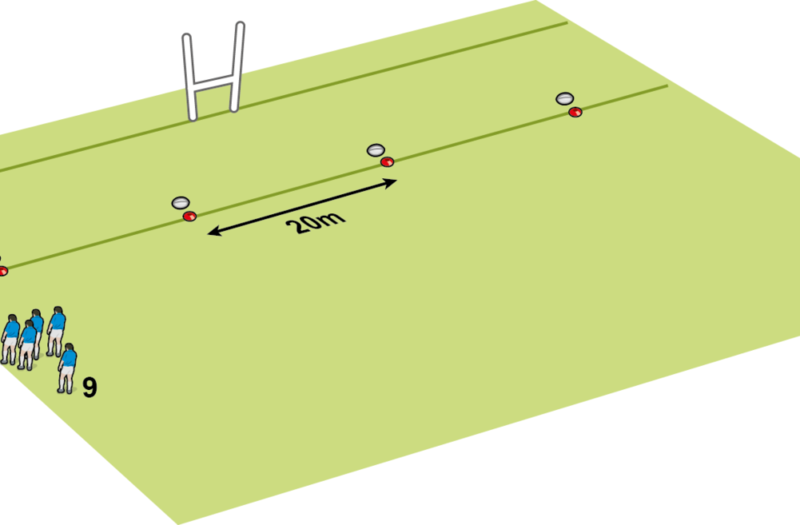 Being accurate with your ball receipt at kick-offs and drop-outs will consolidate your game. So help your players develop their catching, realignment and passing skills with this simple activity. Everyone is involved in this activity. Clear organisation and communication will be evident in the better groups. Mark out a 10m x 25m area, split into three boxes, with two sets of four coloured cones inside each the two end boxes, plus one ball. Put four players in each end box, with one group holding a ball. Shout a coloured cone, and the team without the ball run to those cones inside their own box. A player at the front of the other box lobs the ball high into the receiving box. As he throws, you start counting down from five. 2: B rips the ball and pops it to receiver C.
3: C passes the ball to receiver D.
4: D runs to the front of the box. Score two points to the team if they succeed, one point if they half-succeed. The roles are now reversed so that both teams take it in turns to score. The first team to reach ten points wins. Turn the shoulders towards the sideline to catch the ball. Step into the ball carrier to rip the ball. Realign quickly based on where the ball is. Hands out towards the passer to give him a target.